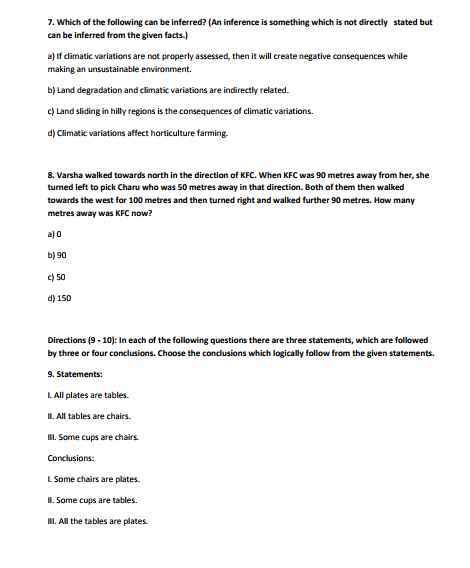 Can you provide me some Logical Reasoning questions with their answers for reparation of Common Management Admission Test (CMAT)? Eight friends-S, T, U, V, W, X, Y and Z - are sitting around a circular table not necessarily in the same order. Three of them are facing outward while five are facing towards the centre. There are equal number of males and females in the group. U is facing the centre. W is sitting third to the right of U. X is sitting third to the left of W. Three persons are sitting between X and T. The immediate neighbors of T are females. Y is sitting third to the right of X. V is sitting third to the right of S. S is not an immediate neighbor of W. The immediate neighbors of W are males and are facing the centre. The immediate neighbors of V are females and face outside. The one sitting third to the left of T is a male. No female is an immediate neighbor of Y. 1. How many persons are sitting between Z and U when counted from the left side of Z? 2. Which of the following statements is true regarding Z? a) The one who is second to the right of Z is a female. b) Z is facing the centre. 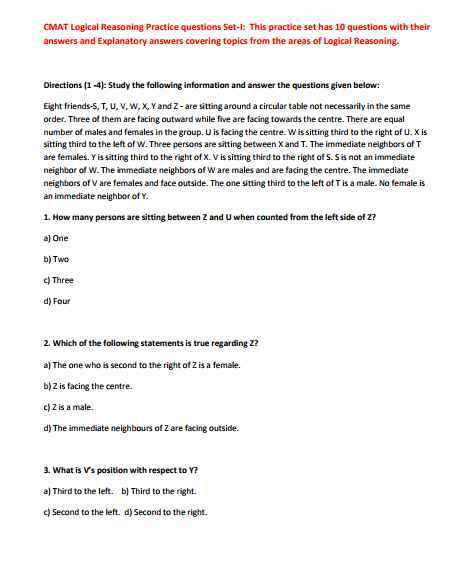 c) Z is a male. 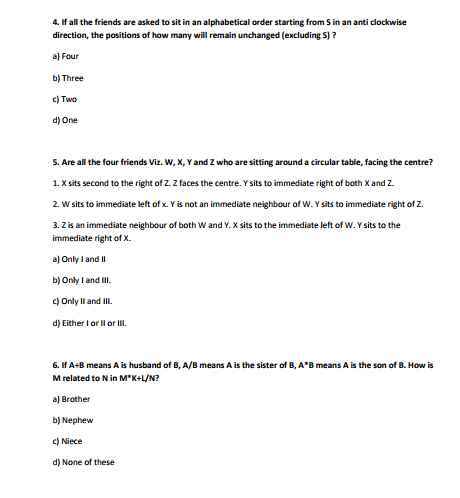 d) The immediate neighbours of Z are facing outside. 3. What is Vâ€™s position with respect to Y? a) Third to the left. b) Third to the right. c) Second to the left. d) Second to the right. 4. If all the friends are asked to sit in an alphabetical order starting from S in an anti-clock wise direction, the positions of how many will remain unchanged (excluding S)?